The Exciting Start of the Last Chance Detectives! 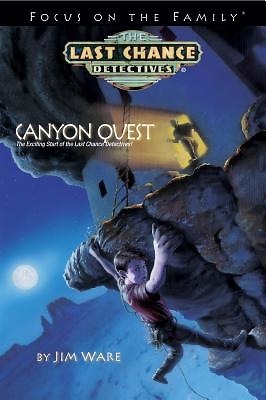 Fans will learn how the Last Chance Detectives club was formed in Canyon Quest, the prequel to the Last Chance Detectives series. When Mike Fowler and his mom move to the dilapidated small town of Ambrosia in the Arizona desert, he is still agonizing over the loss/disappearance of his dad in the Gulf War. Determined to ferret out the truth about his dad's fate, Mike begins studying books on detective work. As a mystery crops up in Ambrosia, Mike is drawn into the case and, in the process of solving it, comes to know Ben Jones, Wynona Whitefeather, and Spence Martin. Their success together in this adventure leads them to form--at the book's conclusion--the Last Chance Detectives.